Bushing mandrel can be used to polish the OD of either a solid or spherical bushing. 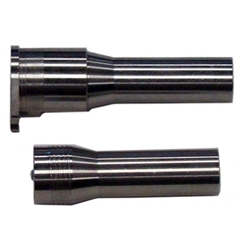 All Briley bushings have a shallow internal modified thread which allows them to be threaded onto the mandrel. The mandrel has a .500 inch shaft allowing it to be chucked in either a drill or lathe. Material is 17-4 Stainless Steel.